Benjamin Banneker (November 9, 1731–October 9, 1806) was a self-educated scientist, astronomer, inventor, writer, and antislavery publicist. He built a striking clock entirely from wood, published a farmers' almanac, and actively campaigned against slavery. He was one of the first African Americans to gain distinction for achievements in science. Known For: Banneker was a writer, inventor, and naturalist who published a series of farmers' almanacs in the late 1700s. Published Works: "Pennsylvania, Delaware, Maryland and Virginia Almanack and Ephemeris, for the Year of our Lord, 1792"
Benjamin Banneker was born on November 9, 1731, in Baltimore County, Maryland. Although he was born a free man, he was the descendant of slaves. At that time, the law dictated that if your mother was a slave then you were a slave, and if she was a free woman then you were a free person. Banneker's grandmother, Molly Walsh, was a bi-racial English immigrant and indentured servant who married an African slave named Banna Ka, who had been brought to the Colonies by a slave trader. Molly had served seven years as an indentured servant before she acquired and worked on her own small farm. Molly Walsh purchased her future husband Banna Ka and another African to work on her farm. The name Banna Ka was later changed to Bannaky and then changed to Banneker. Benjamin's mother, Mary Banneker, was born free. Benjamin's father Rodger was a former slave who had bought his own freedom before marrying Mary. Banneker was educated by Quakers; however, most of his education was self-taught. He quickly revealed to the world his inventive nature and first achieved national acclaim for his scientific work in the 1791 survey of the Federal Territory (now Washington, D.C.). In 1753, he built one of the first watches made in America, a wooden pocket watch. Twenty years later, Banneker began making astronomical calculations that enabled him to successfully forecast a 1789 solar eclipse. His estimate, made well in advance of the celestial event, contradicted predictions of better-known mathematicians and astronomers. Banneker's mechanical and mathematical abilities impressed many, including Thomas Jefferson, who encountered Banneker after George Elliot had recommended him for the surveying team that laid out Washington D.C.
Banneker is best known for his six annual farmers' almanacs, which he published between 1792 and 1797. In his free time, Banneker began compiling the Pennsylvania, Delaware, Maryland, and Virginia Almanac and Ephemeris. The almanacs included information on medicines and medical treatment, and listed tides, astronomical information, and eclipses, all calculated by Banneker himself. Many historians believe that the first printed almanac dates to 1457 and was printed by Gutenberg in Mentz, Germany. Benjamin Franklin published his Poor Richard's Almanacs in America from 1732 to 1758. Franklin used the assumed name of Richard Saunders and wrote witty maxims in his almanacs such as "Light purse, heavy heart" and "Hunger never saw bad bread." Banneker's almanacs, though they appeared later, were more focused on delivering accurate information than on communicating Banneker's personal views. On August 19, 1791, Banneker sent a copy of his first almanac to Secretary of State Thomas Jefferson. In an enclosed letter, he questioned the slaveholder's sincerity as a "friend to liberty." He urged Jefferson to help get rid of "absurd and false ideas" that one race is superior to another. Banneker wished Jefferson's sentiments to be the same as his, that "one Universal Father...afforded us all the same sensations and endowed us all with the same faculties." "I thank you sincerely for your letter of the 19th and for the Almanac it contained. No body wishes more than I do to see such proofs as you exhibit, that nature has given to our black brethren, talents equal to those of the other colours of men, & that the appearance of a want of them is owing merely to the degraded condition of their existence both in Africa & America...I have taken the liberty of sending your almanac to Monsieur de Condorcet, Secretary of the Academy of sciences at Paris, and member of the Philanthropic society because I considered it as a document to which your whole colour had a right for their justification against the doubts which have been entertained of them." Jefferson later sent a letter to the Marquis de Condorcet informing him about Banneker—"a very respectable mathematician"—and his work with Andrew Ellicott, the surveyor who marked the boundaries of the Territory of Columbia (later the District of Columbia). Declining almanac sales eventually forced Banneker to give up his work. He died at home on October 9, 1806, at the age of 74. Banneker was buried at Mount Gilboa African Methodist Episcopal Church in Oella, Maryland. Banneker's life became the source of legend after his death, with many attributing certain accomplishments to him for which there is little or no evidence in the historical record. His inventions and almanacs inspired later generations, and in 1980 the U.S. Postal Service issued a stamp in his honor as part of the "Black Heritage" series. In 1996, a number of Banneker's personal belongings were auctioned, and some of them were later loaned to the Benjamin Banneker Historical Park and Museum. Some of Banneker's personal manuscripts, including the only journal that survived the 1806 fire that destroyed his home, are in the possession of the Maryland Historical Society. Cerami, Charles A. "Benjamin Banneker Surveyor, Astronomer, Publisher, Patriot." John Wiley, 2002. Miller, John Chester. "The Wolf by the Ears: Thomas Jefferson and Slavery." University Press of Virginia, 1995. Weatherly, Myra. 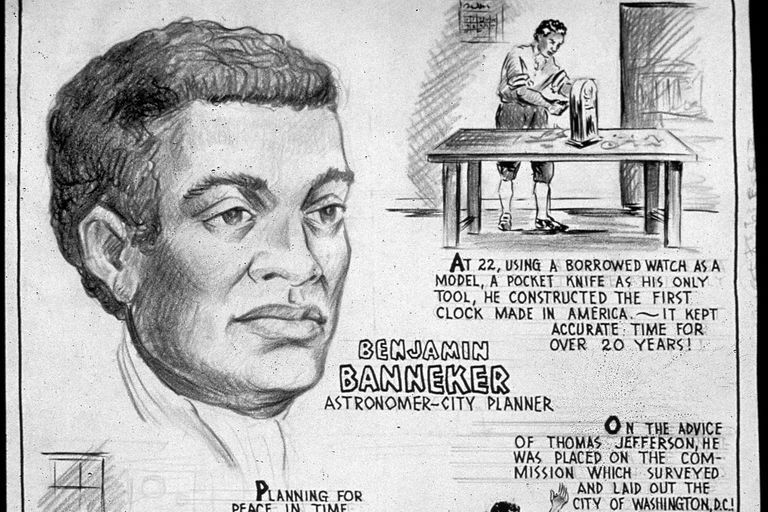 "Benjamin Banneker: American Scientific Pioneer." Compass Point Books, 2006.